We are graciously accepting donations to fund this massive overhaul project! We thank you for your generosity and kindness for bring this dream alive! Wow, what can I say here!!! Coast Longboarding helped blow up downhill and longboarding through the 2000's-PRESENT!!! We've put in almost twenty years in building a wild and crazy Coast family and community on the West Coast of Canada that spread worldwide! We put on the first downhill race in Canada, paying out huge cash sixteen years ago, called "The Attack of Danger Bay". A race that changed the world!! A race that still runs today, paying out over $8000.00 bucks to the racers every year!!! While the skate industry closes their doors to events that brought them to this point. Fast-forward to Danger Bay sixteen we have two kids, we have been together nineteen years and we live a block from the beach. I have a steady job at the Post office when I want it, we live in a CO-OP downtown Vancouver, with over thirty other little kids Billie and Cassius' age to grow up with, it's perfect!! (But I could loose two hundred pounds!! Hahahaha nothing is perfect I guess eh.) We're really happy here! I skated the biggest, craziest hills I've ever seen in all of Canada and there were even some I was not even skilled enough to skate, some I couldn't skate!!! I slept on the beaches, I partied with locals in a barn while listening to the legendary Cape Breton fiddler Buddy McMaster while he raised the roof. I met a couple good buddies, went bear hunting, shot guns and crossbows, shuttled more of the Cabot Trail hills, I had the full experience and I promised them the next time they see me "I'm bringing a crew to skate these hills." I kept in touch with these two even today and eleven years later I showed up with the Cribb Bomb Tour with a crew and blew their minds!! I knocked on my buddy's door and said I told you I'd be back one day and I would bring a crew, along with huge smiles and hugs!! I thought long and hard and realized that there is nothing left for me to do here. The West is set up!! We have races all summer long in a bunch of different towns; my tour has been running five years all over the B.C., Alberta, Washington and Oregon. I've announced over two hundred events in fifteen years. People have started careers off of the Coast wave and are killing it. Racers have lived the life getting paid and flown around the world to race!! We can brag about at least six world champions coming out of our Coast scene!! TV shows with us have been on TV nation wide, we've been viral, and it's been unreal!! But this is how it's supposed to be, it's perfect timing and in life you need to see these signs and decide to take them or sit back and relax with what you've got now, because its pretty dam good. I'm not letting this wave pass, I'm jumping on it and thank god Patricia sees what I'm seeing and is in fully without even ever visiting the Cabot Trail!! Man I love her!! Nothing without her! It's time to start it all over again and set up shop with the knowledge I know now after living this life for the moment. If I never lived like this, this opportunity would have never manifested! I would have never seen this wave. I would never take anything back ever! This was never the plan, moving away from everything we've done, our roots, all of our family and friends wasn't the plan, but this idea just smacked me square in the face like longboarding did. I see this vision!! But never planned for it and now were going to live it. This is where it all started to take shape. I just started filling Stu's ears with ideas and dreams that I have had over the years of traveling the world longboarding and announcing races while staying in hostels. I talked out loud working it all out for the last three hours of the drive home while the crew slept and Stu listened to me repeat myself like I'm doing today to you all writing this. Another dream I've always talked about was to build a Coast Longboarding museum one day... I've got so much Coast memorabilia from over the years that I have packed under my bed, stuffed in closets and got it hanging from the roof. I got unlimited stories, pictures, videos that need to be seen. Memories from all these years!! Faces that have built Coast to what it is today, faces that have disappeared over the years but can always come back to the Coast Longboarding museum and catch up, a place where you can relive the old times. If you can still skate, stay a weekend with us and I'll take you on a tour around the Cabot Trail where you'll be smoking yer shoes and scratching guardrails ripping downhill!! I wanna use all the skills I have taken over the years and start something up. This falls right into the church vision. We're right on the Cabot Trail. It's in the middle of the highlands Canadian national park. The church is on commercial land!! So we can use the basement to open up a store or some sort of art/coffee shop and work on some sort of tourist trap to trap those tour busses full of people that round the trail. This should fund us; we don't need much to live at all!! I mean if the summers pay our bills, in the winter we could take this veggie oil bus, home school the kids and come see you all on the west!!! I see this Church Hostel, Museum and whatever tourist trap we think of being in the main Cabot Trail, Cape Breton tourism book as a destination so everyone stops there!! Like Rolf the wood carver in radium BC with his wild house full of woodcarvings and art!! He's got it figured out! People pay two to four bucks to walk around his place!! He makes a killing and lives life to the fullest!! 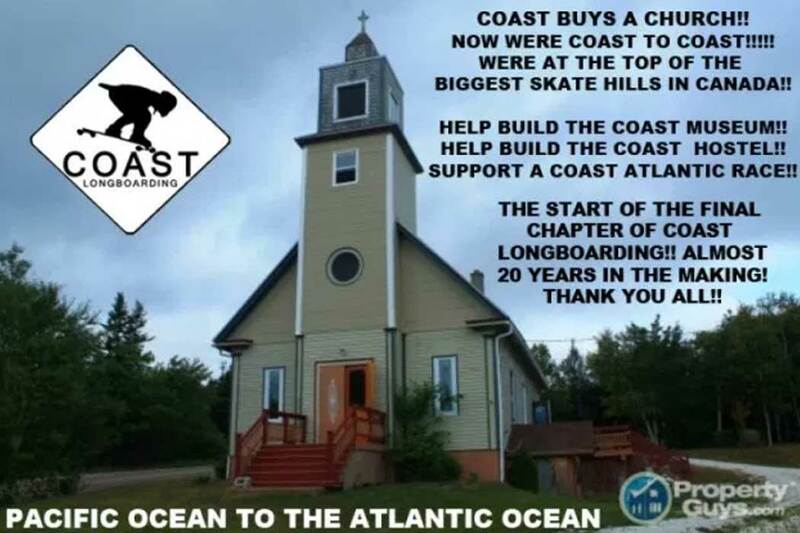 I'm a broke skater that has given everything to the Coast community and it's been a wild ride, but this is the next page of Coast and our lives and as of today April 28th, my late mom's birthday, we put a lien on my mom's place so we could take a loan out to buy this church!! Mom is proud as hell and if she was here with us she would be fifty-two today... she passed at forty-seven of cancer. Today we bought the church!!!! It's official!! If she were still here she would be coming with us, guaranteed. We bought the church, but we don't have the cash to fix it to code, make the move east and open up the Coast Museum Hostel!! But I couldn't let the fear of money get in the way so I have a few ideas. First thing's first, we started this campaign to help with the reno's and that means we need to INSULATE THE WHOLE CHURCH first!! While we do that, we need to upgrade the church from 60amps to 200amps!! Once this is done, we can move in and save the $2200.00 rent we pay now a month in Vancity and put that towards us trying to open up!!! 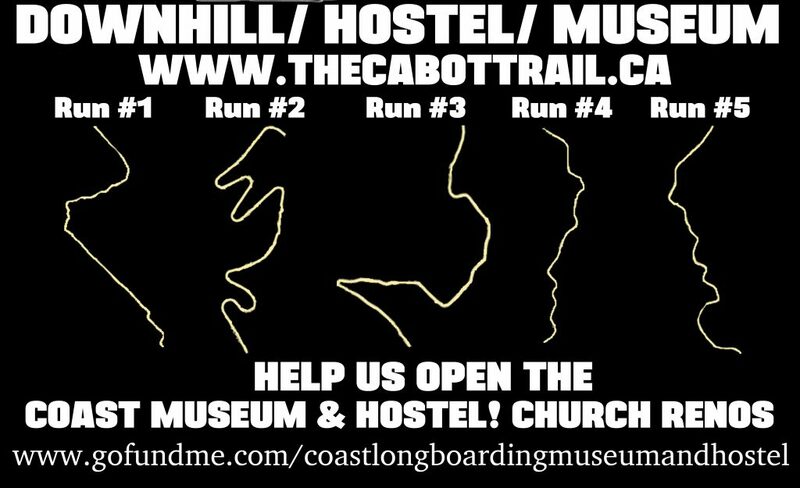 SO I'M REACHING OUT TO ANYONE OUT THERE WHOSE LIFE I HAVE IMPACTED OR CHANGED IN ANYWAY OVER THE YEARS TO HELP ME OPEN UP THE COAST LONGBOARDING CHURCH OF DOWNHILL, HOSTEL AND MUSEUM!!! AND DONATE!! THE FUTURE.... 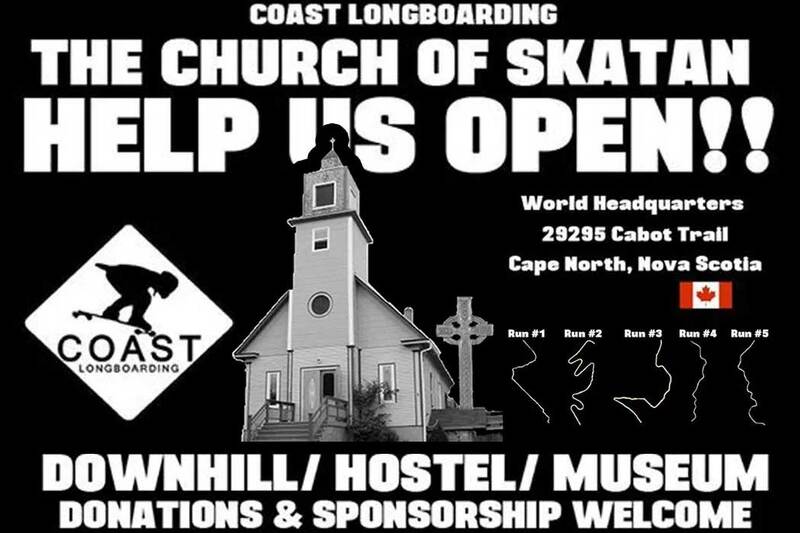 In the end... Coast Longboarding owns a Church at the top of five of the biggest roads in Canada!! We'll hold a race on the Pacific Ocean (Attack of Danger Bay) and hold a new race on the Atlantic Ocean (not sure where yet) so we have both coasts with races rolling while running a Coast Hostel open to everyone along with a Coast Longboarding Museum to keep the memories alive and of course a sneaky little tourist trap to catch those tour busses driving right by to pay for us to live!!! And that's it everyone!!! We're doing it with or with out yer help!!! We will not fail!!!!! Coast Longboarding forever!!!! It's like chasing the dragon, going to the East and doing it all over again. Seeing the rider's fresh excitement & stoke!! Fresh events!! Everyone's love of skating and living it all over again!!! Peter are flying to Cape Breton, to meet with you and view what we've been calling in our family recently, ‘hopefully our forever home'. As I am staying West Coast bound with the children for this viewing, I wanted to write a letter and take this opportunity to thank you for meeting with our family and considering our offer on your lovingly renovated church. It would be a dream come true to call your church our forever home. We are a young family with strong ties to our community here in Vancouver, the Cariboo and on the Sunshine Coast, British Columbia, yet we cannot afford a forever home in this West Coast housing market, where housing prices are astronomical. 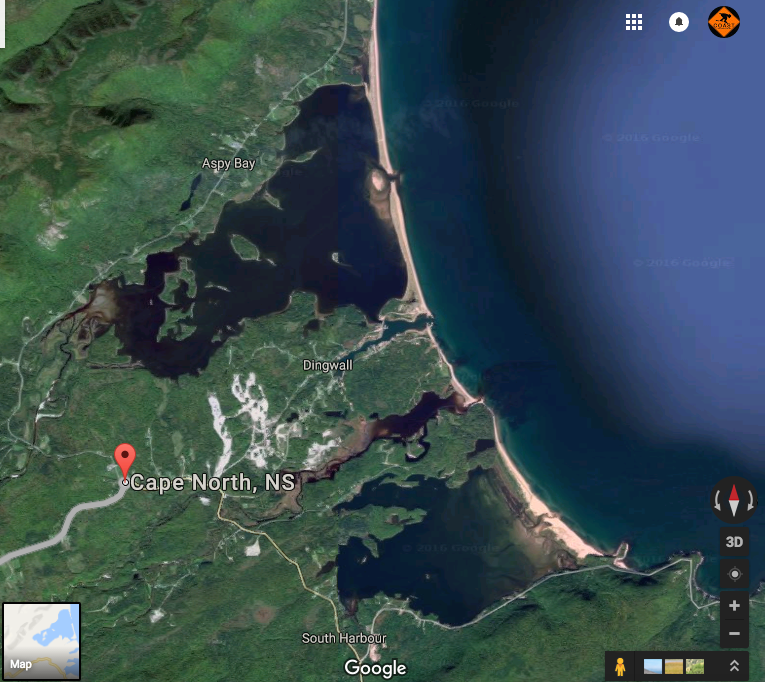 My partner Bricin has fallen in love with Cape Breton and the Cabot Trail over the past decade. He has journeyed there and back again, travelling across Canada twice: once for charity and once, more recently, for sharing the journey of a lifetime with like-minded travellers. My father's sister and two nieces live in NS and I have a dear friend whom I taught preschool with, who grins from ear to ear with the possibility of us moving to NS. Our family and friends in NS may be a small fraction in comparison to who we know and love on the West Coast, yet in my heart of hearts, and in Bricin's too (we've been together for 18 years as high school sweethearts), we know that your lovingly renovated church on the Cabot Trail is the absolute, without a doubt, perfect fit for our young family. I have to pinch myself to think that it could be a reality to raise my children surrounded by natural beauty, neighbouring a national park and minutes from sandy beaches. My daughter has always been a nature girl and that drive within her would only blossom further when taken out of downtown Vancouver to thrive on the Cabot Trail. My toddler son has rhythm in his soul, and to have the opportunity to raise him with ceilidhs surrounding us, I just shake my head and smile! I crave a slower pace of life, surrounded by nature and friendly smiles and community connections. Reading the reviews on your Air BnB site and how guests mention the humming birds, reminds me of growing up in beautiful Pender Harbour, far far away from any city's hustle and bustle. Bricin craves spending time with his children and showing them how to build a life on your own terms and follow your dreams. He also has a strong desire to share his energy and passion within our new community and the chance to meet new people and inspire others to live each day to the fullest. To us family is everything and the opportunity to raise our young family in a ‘forever home' such as your church would be immeasurable. Our children are so excited at the thought of moving. With my father joining us, they squeal "we'd get to see Grandpa every day!" each time we talk about it. So thank you again for meeting with our family and taking the time to read my letter. It is clear to see that you have created something truly special when renovating the church, and it would be an honour and an opportunity of a lifetime for our family to become the proud new owners of such a beautifully unique and special home.